Description: This jewel encrusted Cubic Zirconia cuff bracelet is completely etched and the CZ bejeweled motif covers the top of the bracelet. 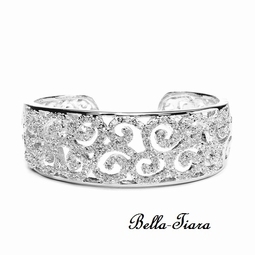 The sides of the cuff continue the etched scrolls motif in lustrous, smooth polished silver rhodium. This popular cuff bracelet adds regal sophistication to your jewelry display case.